Armchairs are not just for the living room. They make the perfect touch for a bedroom; giving you somewhere to relax before beginning the day. This handcrafted armchair has ornate, floral designed, hand carvings on the crest of the “C” shaped seat back. The chair is supported by four, wood turned, trumpet style feet. The upper seat cushion, the scrolled armrest, and the inside seat back are upholstered in brown full grain leather. All sides of the lower base and the front of the armrest are upholstered in embossed full grain leather. 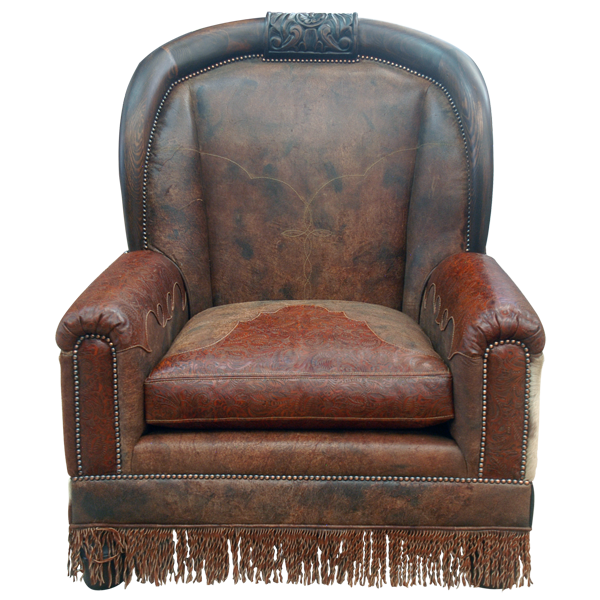 The upper inside seat back has an embroidered Western cut design with an embroidered Spanish colonial style cross in its center. The lower seat cushion also has a Western cut design. 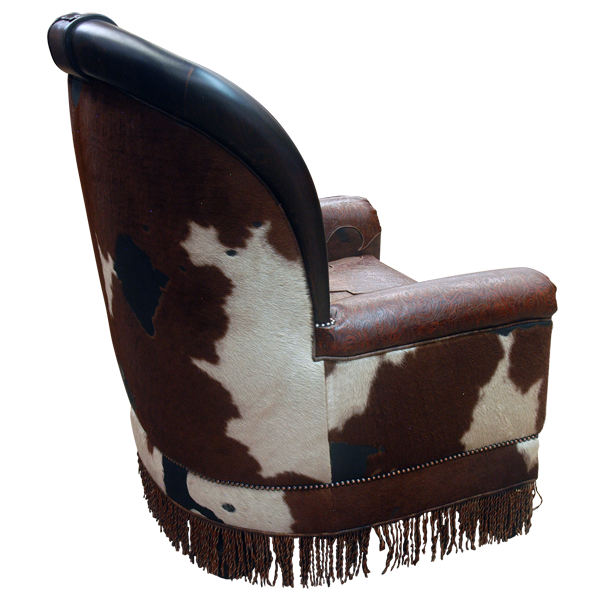 The reverse seat back and the exterior sides of the chair are upholstered in patterned, real cowhide. Leather fringe is hand tack to all sides of the lower base of the chair. The leather is double stitched together for extra strength and durability. Additionally, the upholstery is hand tacked with precision to the entire wood frame by our skilled craftsmen. Both comfortable and durable, this chair is made with the best, sustainable wood available. It is 100% customizable.